Vertical gardens don’t only look pretty they can be set up virtually anywhere and bring a lot of benefits for hobby- or professional gardeners. Gardening is a lovely pastime and great for body, mind and soul. Unfortunately many people don't have access to a piece of land that they can use to grow flowers, or vegetables in the traditional horizontal style. But the good news is that nearly everyone can have a little garden now even on the tiniest piece of ground. The way to do this is by growing plants upwards. 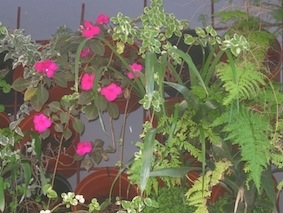 You can start a Garden on your balcony, windowsill, the backyard, on a wall of your home or your garage or a trellis. 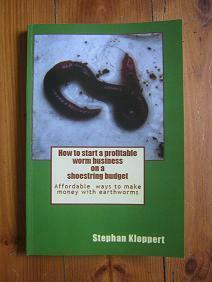 There are so many options that you should be able to find one that suits you. 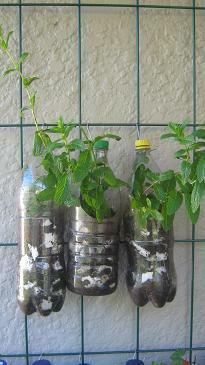 Recycled bottles with herbs hanging on a trellis. Perpendicular gardens can be started on a shoestring budget using old tins, bottles or buckets or with special containers that can be purchased and will work perfect in the allocated space. You can grow more plants on your limited space. In many vertical Garden systems you can save water when the lower plants use the unused water from the plants above them. It’s much easier to work with your plants as you don’t have to bend down or get on your knees to feed, prune or harvest. 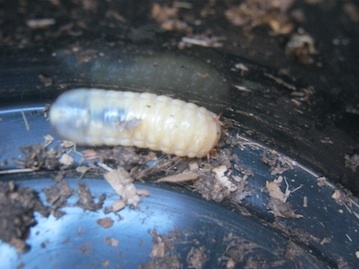 Your plants will be better protected against pests like slugs and snails. Plants will not be trampled down by dogs or children. Due to the elevation on different levels all plants will get more sun and more access to fresh air. Plants can be easily interchanged and replaced if needed. Due to the points mentioned below more flowers and more vegetables can be grown per square meter. If the plants are covering a whole wall they can absorb the heat of the sun in summer and contribute to a lower temperature inside the house. 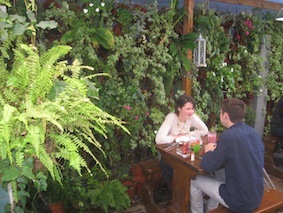 The plants can be pleasing to the eyes, converting a brick or concrete wall into a colorful living environment. Plants produce oxygen even indoors so having a Vertical garden will be beneficial for your living space inside and outside. Hanging plants in Cape town. 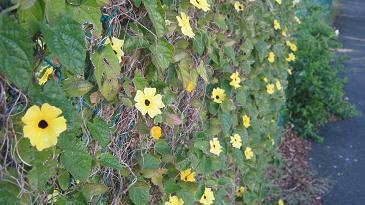 Flowers growing on a fence. There are so many ways to implement a perpendicular garden. You can hang pots or containers on an existing fence, buy some wire mesh and hang your plant pots onto it. Use a flight of stairs for your plants, or a ladder or a stepladder. Plastic pots on a trellis make a great vertical garden. The ways to start perpendicular gardens are sheer endless. If want to share your ideas for vertical gardens with us and other garden friends you can send us pictures and your comments on our contact page. You will find the link below. Gardens above the ground do usually have very limited space for the plant containers and so it is vital to provide the plants with excellent soil and nutrients. That's why we suggest to make use of natural soil conditioners like worm castings and worm tee as well as earthworms when setting up a garden. 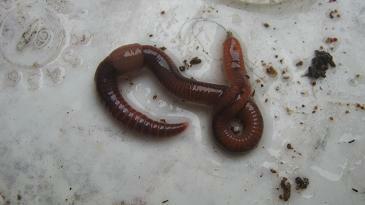 The worms and the plant foods they produce are the basis for fertile soil to be used in pot- and container gardening. 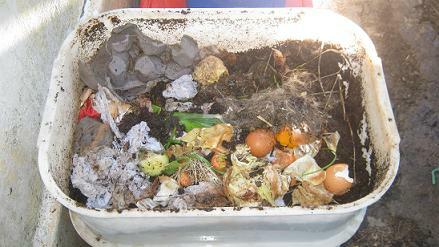 On our pages about worm composting you can find out all you need to know to convert your kitchen- and garden waste with the help of compost worms into nutrient rich plant foods. 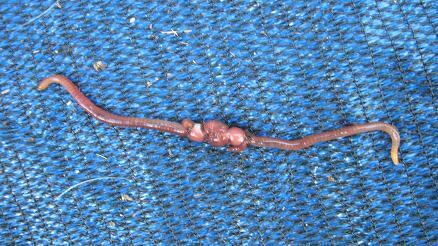 Earthworms improve your garden soil. 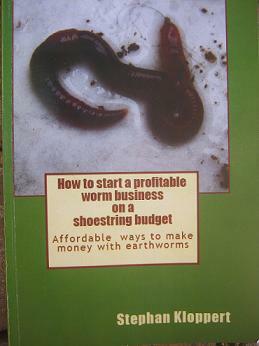 Worm castings an amazing organic plant food. See our Gardening tip's page.